Welcome to my Apeman Trawo A100 review! Today I want to talk about the latest action camera model from Apeman. It’s called the Apeman Trawo or A100 and it is the successor of the Apeman A80. When I think of action cameras, GoPro always comes to my mind first since they are the number one leader of action cams in the market. However in the last couple of years, many companies started producing action cameras at a very low price. One of these companies is Apeman. Apeman claims that the Trawo can record real native 4K with EIS enabled. What do you think of this claim? Well, let’s find out! Field of View: Wide (170degrees), Medium, Narrow. I always liked the packaging of the Apeman cams and found it attractive compared to other cheap action cameras or even GoPro. So inside the box, you will find the Apeman A100 Trawo inside the waterproof casing, this makes the camera waterproof down to 30 meters. A user manual that covers all the specifications, features and functionalities of the camera, and it comes with many languages. 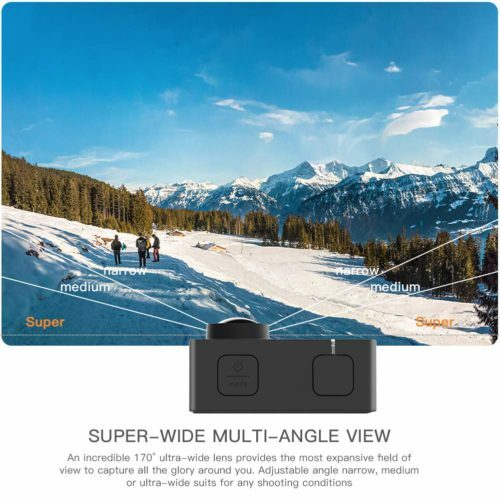 Useful if you are not very familiar with using an action camera. Then, you will see two rechargeable 3.7V 1350mAh batteries. A nice gesture from Apeman so you don’t have to buy a second battery. They also include a bunch of accessories like bar mounts, tethers, adhesive mounts, clip mounts, etc.. so you can basically mount the camera anywhere. There won’t be a need to buy separate accessories as most of the basic ones are included in the box. 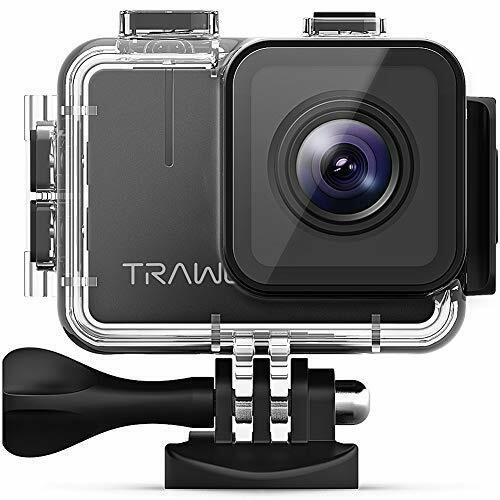 The Apeman Trawo has a similar design to most of the other action cameras in the market. The body is made of black plastic and it has a 2 inch LCD screen at the back. At the front, there is the Panasonic lens, a small LED light and the camera’s logo TRAWO. At the back of the camera, there is a 2inch LCD IPS screen, it has a good viewing angle and it is bright so you can clearly see the preview. It is not a touch screen so the buttons on the side of the camera must be used to navigate through the menu. I prefer to have both the touch screen and the buttons in an action cam. Because once the touchscreen camera is in the protective case, the screen cannot be used so you use the buttons instead. At the top, there are two buttons. The power/Mode button which is used to turn the camera on and off, and to switch between video, photo, media library and settings. Press and hold to turn the camera on or off. Press once to switch modes. The second button is the shutter button used to take photos, start/stop videos and also acts as an OK/Select button and Settings button. On the right side, there are two buttons, Up and Down. These also have two functions. To navigate up and down through the menu. And to turn the WiFi and mic on or off. The Up button if pressed twice can turn the WiFi on or off. The Down button if pressed twice can turn the mic on or off. On the left side, there is a small door that covers the micro USB port which is used for charging and data transfer. The mini HDMI port used for connecting the camera to a big monitor or TV. And finally the micro SD card slot. The Trawo supports Micro SD cards up to 128GB. At the bottom, there is the battery door. Once charge on this battery, can give you around 50 minutes of 4K recording and maybe around 90 minutes for 1080p recording. The Trawo comes with most if not the same features that come with the A80. 1- Resolutions: To set the video resolution you wish to use. The Trawo starts with the highest video resolution at 4K at 30 frames per second, down to 720p at 120fps. 2- Image Size: To set the image size, starts at 20 Megapixels and goes down from there to lower resolutions. 3- Loop recording: To set continuous recording on and off. Mostly used for dash cams and security cams. However, there is no Driving Mode on the Trawo. 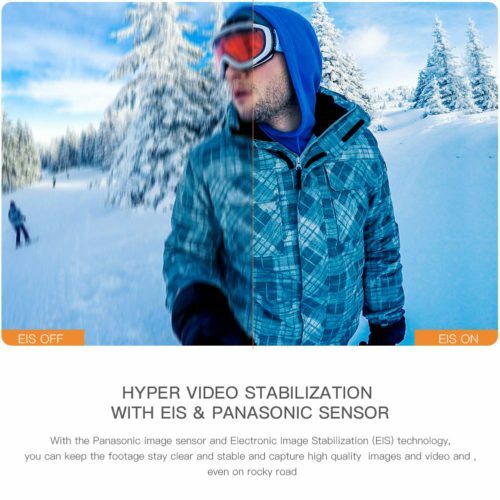 4- Anti-shake: Also known as EIS (Electronic Image Stabilization) which makes the videos smoother and less jittery especially while moving fast or doing extreme sports. Unlike the previous A80 model where the EIS was only supported with the 1080p resolution. With the Trawo, the EIS works with the 4K resolution. This is a great advantage and one of my favorite features in this camera. 5- Lens angle: To set the Field of View at different angles, it starts with Wide at 170 degrees then Medium and Narrow. 6- Time-lapse: To set the time-lapse interval. This option is for video time-lapses only and you can get these intervals 1s/2s/5s/10s/30s/60s. Then you have the usual settings like timer, exposure EV, ISO, AWB, Scene, Light Frequency, date/time. 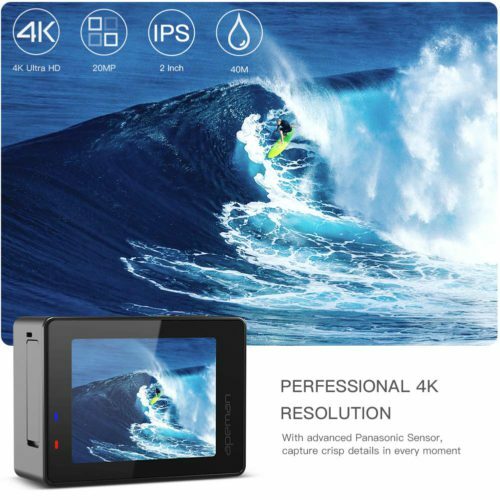 As I previously mentioned, the Trawo offers 4K video resolution at 30 frames per second. And we’re talking about real native 4K and not the interpolated 4K that was in the Apeman A80. However, there is one thing I noticed when the EIS is enabled on the 4K resolution. The Field of View gets narrowed automatically, so it won’t keep the same wide angle it had when the EIS was off. Not a big deal, but this is just another flaw I noticed and wanted to highlight it. Below the 4K, you have the 2.7K at 30fps, 1440p at 60/30fps, 1080p at 60/30fps, 720p at 120/60fps. The image stabilization works fairly good maybe not the best compared with a GoPro Hero 6. The camera uses a HI3557 processor and a Panasonic MN34120 sensor that provides a 170 degrees angle of field view. The previous A80 model used a Sony sensor that is weaker compared with this Panasonic sensor. The daytime footage look really good when shooting with 4K at 30 frames per second, colors are bright and the dynamic range is ok maybe not the best. 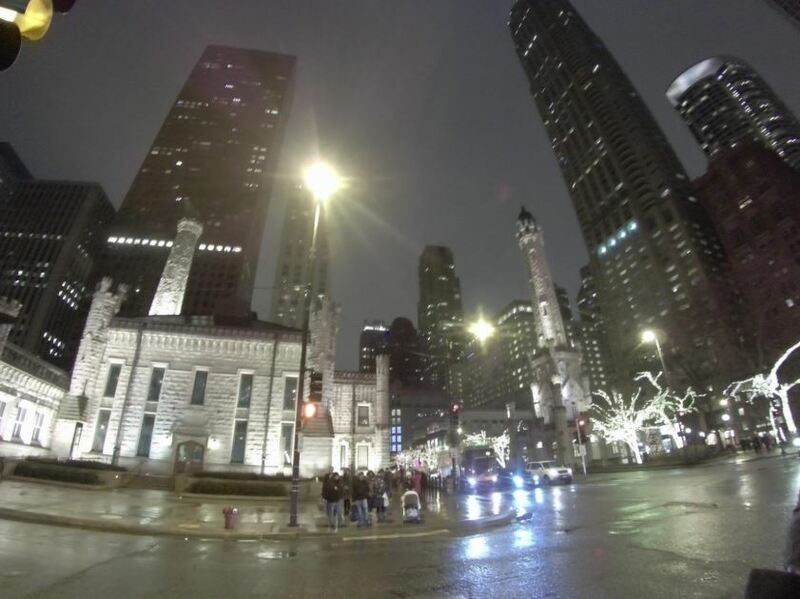 Now when it comes to night time footage, it is a total disappointment. The videos look dark, grainy and low quality. I have seen the low light issue on other similar budget cameras but didn’t expect to have it with the Trawo since this one has a f/1.8 aperture lens. These action cams should be used during daytime and with a lot of light. Apeman claims that the image sensor can take 20 megapixels photos which is not true. The best you can get is 16 Megapixels native resolution, and the photos are not great either. The 20 megapixels appears to be an interpolated resolution rather than native resolution. 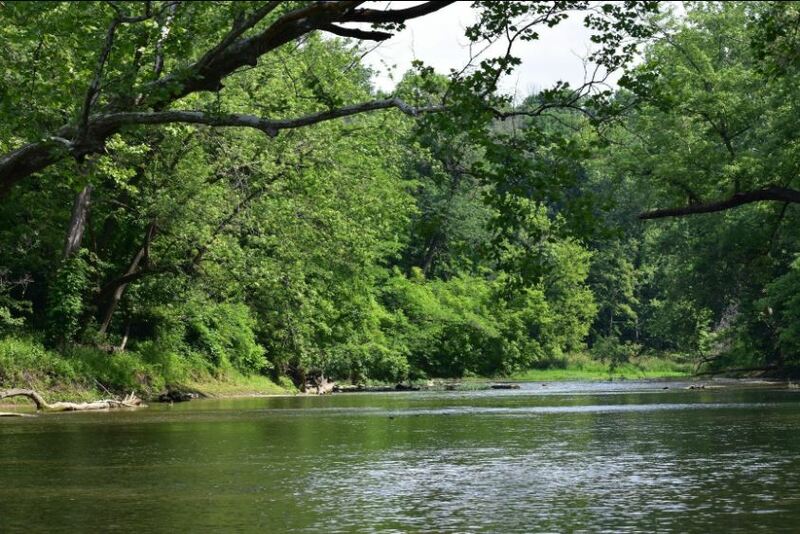 Learn the difference between native and interpolated. Even with full day light, I noticed that the photos can be a bit grainy. They are ok though but not the best. I don’t recommend taking photos in low-light because the less the light you have, the less the photo quality you will get. Again, I think it’s unfair to compare it to a GoPro due to the huge price difference but photo quality can be worked on a bit. I didn’t really like the audio recorded through the camera’s microphone. It’s ok but not very good especially if it is a bit windy outside. The sound is not very clear and can be a bit muffled. So imagine how it will sound with the case on. This is expected with these types of cameras, as most of these budget cams have the same issue with the microphone. But hey, I can’t complain, it’s still very cheap compared to a GoPro. 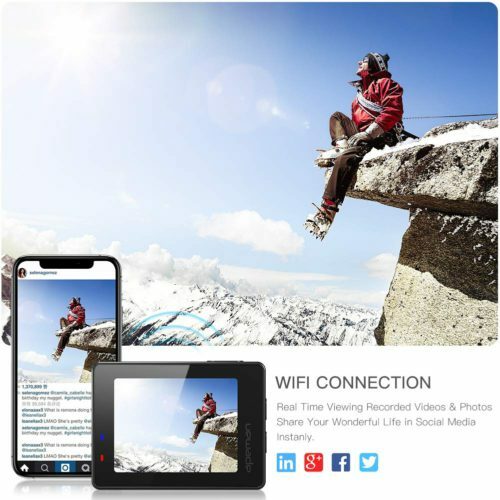 Like most action cams, this camera comes with WiFi functionality and broadcasts its SSID which enables you to connect your smartphone, PC or tablet. To turn on the WiFI, double click the UP button on the side of the camera. Once It’s on, the SSID and Password will appear on the camera’s screen. 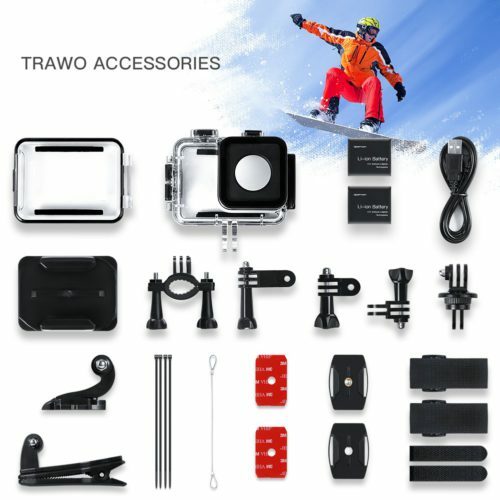 Use these to connect your phone or anything else to the Trawo cam. In order to remote control the camera from your phone, you need to download the YUTUPRO from the App store for Apple phones or from the Google Play store for the Android phones. From the app, I will be able to see the preview of the camera, I can fully control it, like recording videos or taking photos. I have noticed some delay between the camera and the app, but this is normal and I noticed it in many other action cams, some are worse than others. The WiFi signal from the camera is not that great so the distance between the camera and the phone should not exceed 8 to 10 meters as I have experienced some disconnections. I can also change settings like video resolutions, turn features On or Off. It is easier for me to change settings from the app. I can also watch the recorded videos and the photos I took on the phone, delete the ones I don’t want and even download the ones I need directly to my phone. As you have seen in my review, the Trawo can be a good camera if used during daytime, as the low light can severely affect the video and photo quality. The 4K video resolution is real but with a narrower field of view unlike the GoPro Hero 6 Black that records in 4K wide FoV. It has few useful features, what I liked the most is the Electronic Image Stabilization compatibility with 4K. That didn’t exist in the previous A80 model. 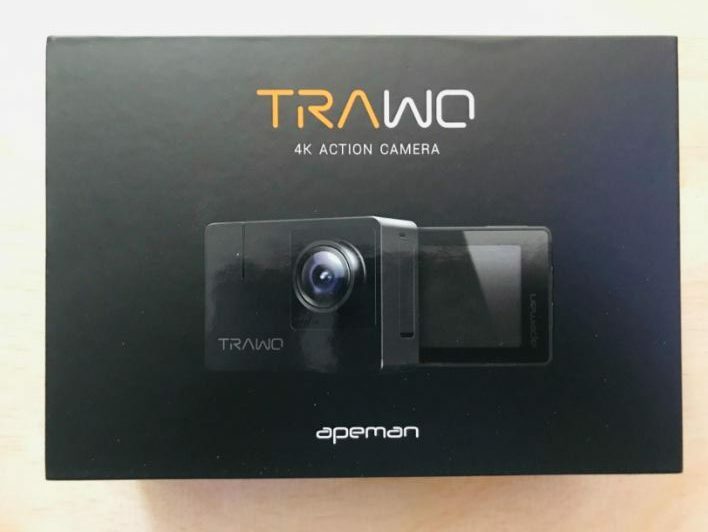 I would recommend the Apeman Trawo only if you are not looking to spend money on a GoPro. Because if you can afford a GoPro then go for it, I would recommend the GoPro Hero 6 Black. At the end of the day, the Trawo costs less than 90$. Soif you are not too picky when it comes to very high footage quality then go for it. I hope you enjoyed my review of the Apeman Trawo A100 and found it useful.